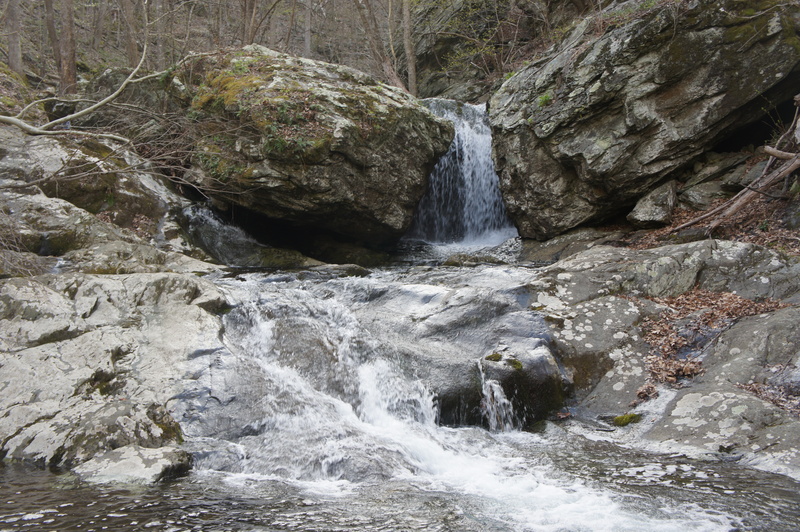 The nearly 8-mile trail up Whiteoak Canyon and down Cedar Run is easily one of the most scintillating loop hikes in Virginia’s Shenandoah National Park and features a string of excellent waterfalls that is perhaps unparalleled in the state. 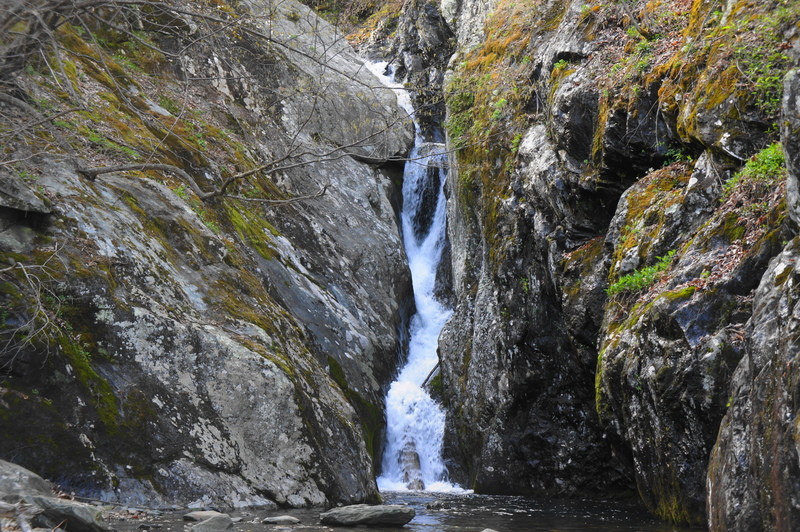 Except for a dull connector trail between the two watersheds, the hike in Shenandoah’s Central District packs a nearly endless flow of beautiful scenery: what Whiteoak Canyon offers in awe-inspiring waterfalls, Cedar Run matches with serenity and majestic cascades. Hikers pay for the scenery, however, with a gain of around 2,200 feet in elevation, making this strenuous hike an all-day journey for many visitors. Jaw-dropping natural beauty also attracts the masses, so get an early start to avoid some of the crowds. The trail begins at the end of the lower parking area; here there is a small ranger station where you should pay the Shenandoah entrance fee (or show your National Park Pass). 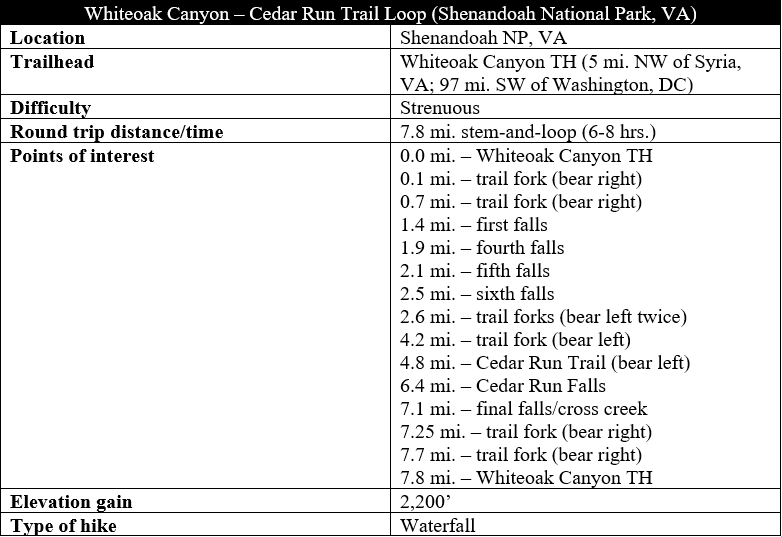 The trail map at the start recommends two shorter versions of the hike that exclude the Cedar Run section; the following description, however, covers the entire loop, rated “very strenuous” by the National Park Service. Begin by following the wide, well-trodden path as it bears northwest toward the park boundary. After 250 feet, the trail crosses a steel bridge over Cedar Run and enters Shenandoah National Park; within a couple minutes, the trail splits, marking the official start of the loop. 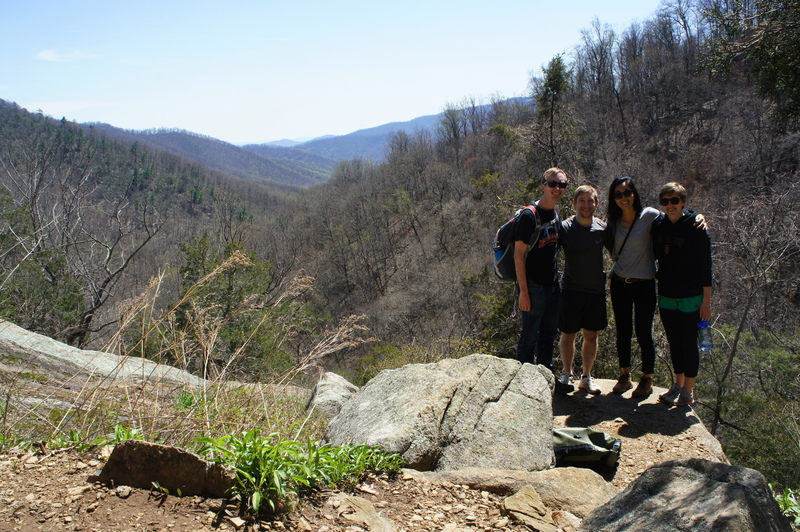 Take the right fork, following the Whiteoak Canyon Trail toward the area’s tallest waterfalls. 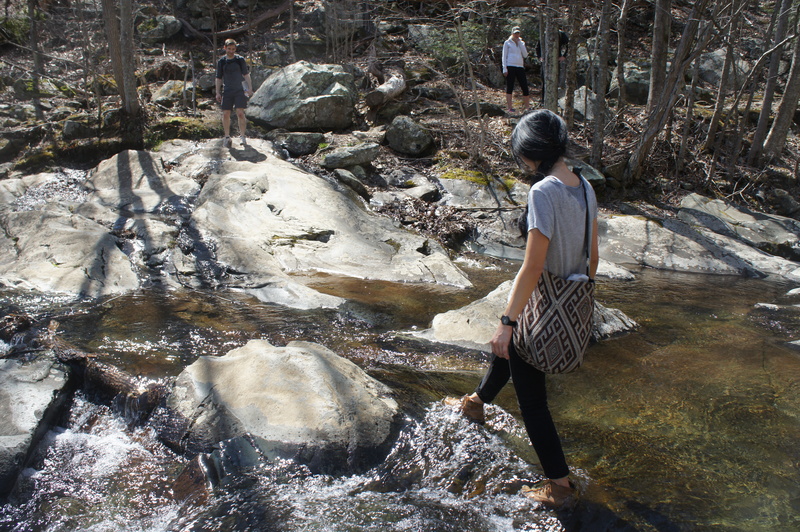 Traverse a small stream at 2/10 mile, then continue across another steel footbridge over the Robinson River, the waterway responsible for carving Whiteoak Canyon. Once across to the right bank, the trail bends northward and begins an initial climb, the first of many on this strenuous trek. 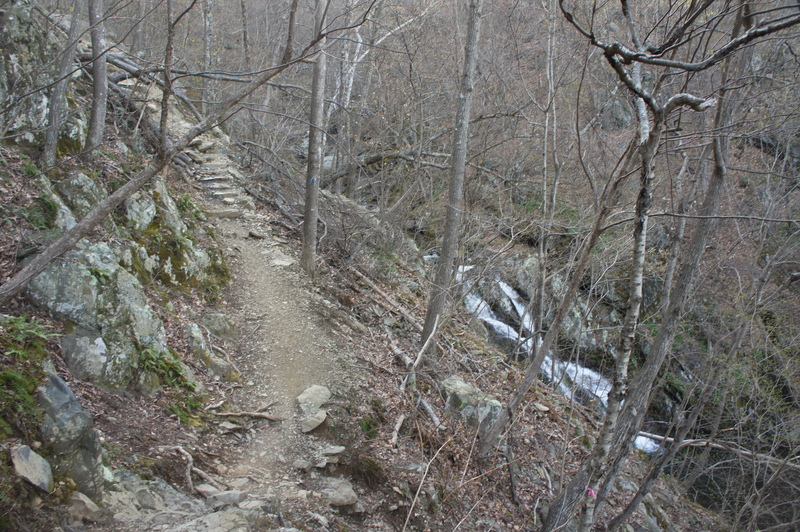 At 4/10 mile, the trail briefly levels off and then drops back down to stream level. 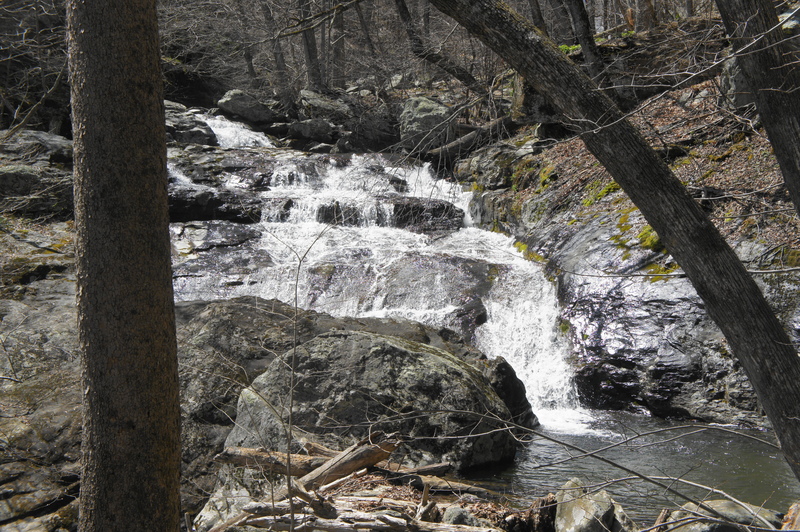 The creek here is already lovely, with the water tumbling gently as it descends the mountainside. At 7/10 mile, the trail forks again, as the Whiteoak-Cedar Run Link Trail bears off to the left across the stream. Stay right on the Whiteoak Canyon Trail, which soon enters a switchback. At around 9/10 mile, hikers will approach a confusing junction in which blue blazes appear to indicate that the trail is heading right uphill. Instead, the real path drops down to the left, clearing a ravine. The cascades grow bigger as hikers enter the second mile, and an 8-10 foot waterfall on the left at 1.25 miles offers a prelude of what is to come. 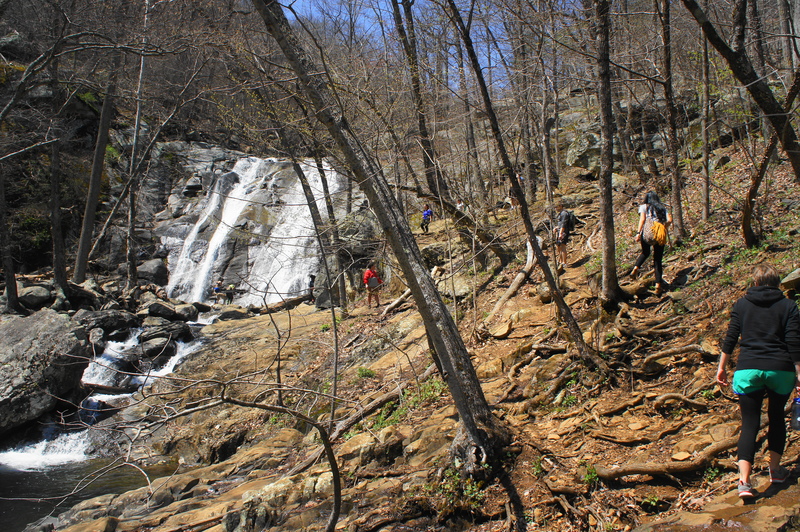 As the roar of tumbling water grows louder, hikers get their first glimpse of the first falls at about 1.3 miles after clearing a small tributary. 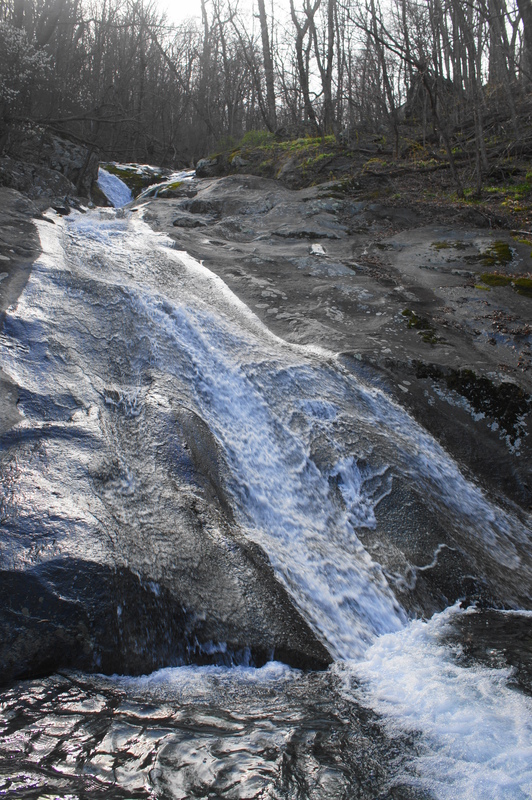 The trail leads to the base of the 60-foot waterfall, which splits in two as it plunges into a small pool. 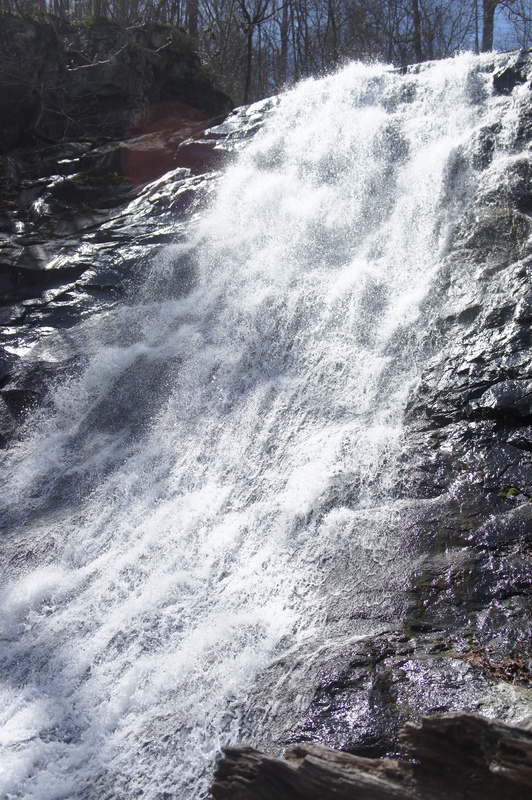 Being the easiest to reach, this waterfall is often the most crowded. The crowds thin out, however, as the trail begins an arduous, switch-backing climb up to the right. 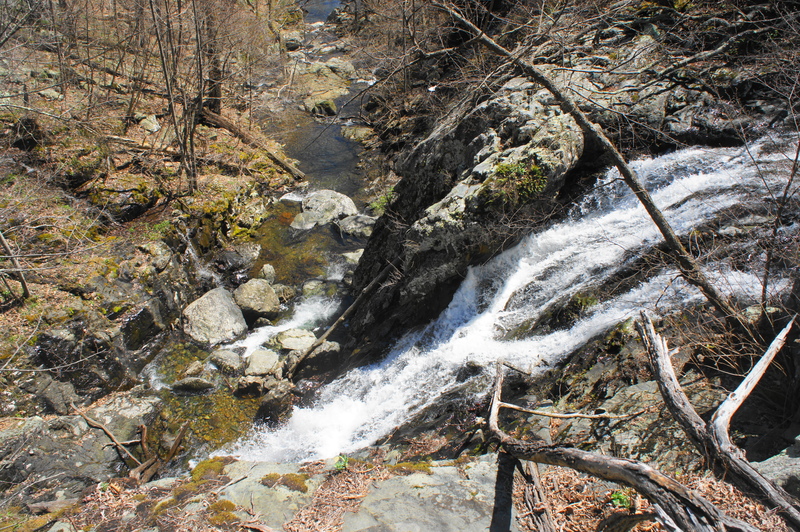 High above a tributary to the east, hikers can spot glimpses of another falls along that stream, impressive in its own right. 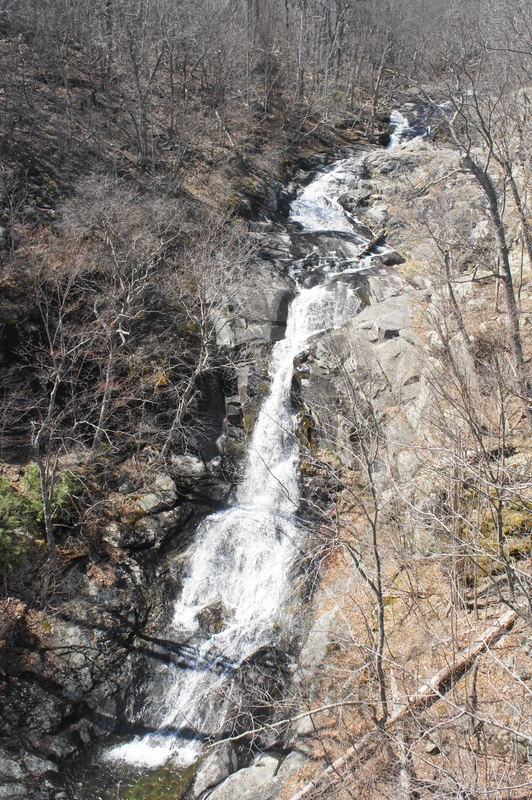 At around 1.6 miles, hikers will have a view of the second and third falls—each between 40-50 feet in height—down in the valley below, but at a good distance and partly obscured by trees. 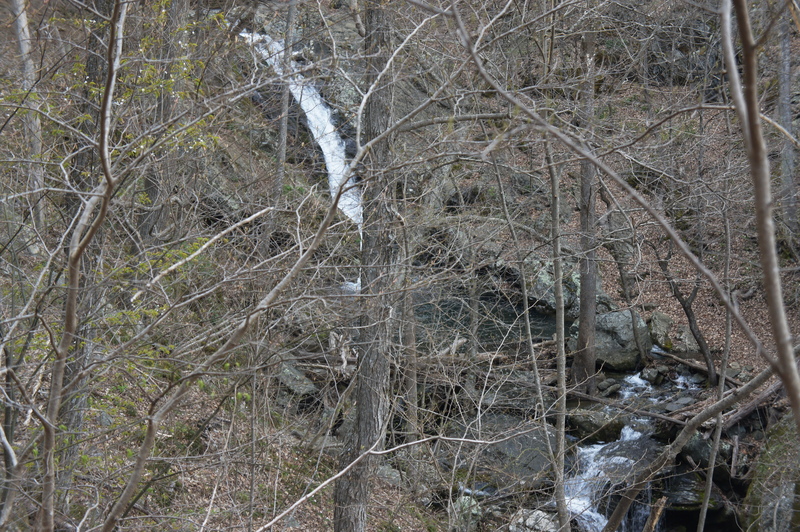 (Note: It is possible to access these waterfalls, but it requires backtracking to the top of falls #1 and following the creek upstream.) Just beyond, now well above the main creek, a clearing offers an unobstructed view down-canyon to the south. 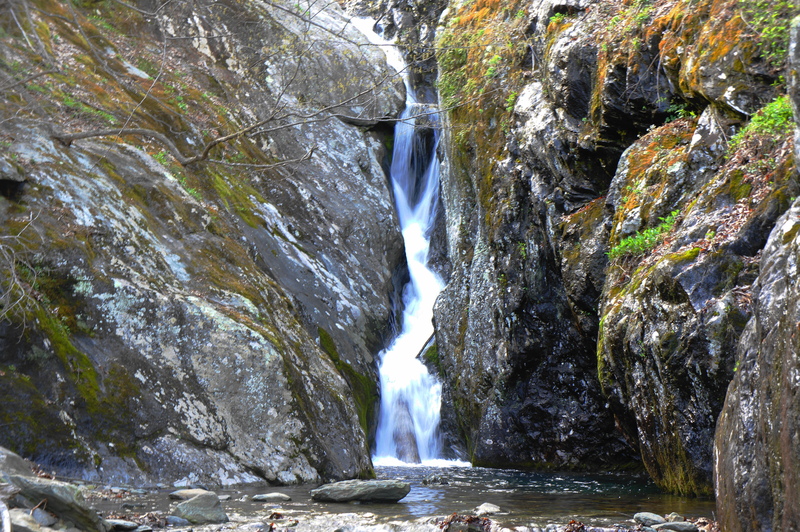 The trail continues to climb as it approaches the fourth falls in Whiteoak Canyon; this one drops 35 feet but is hard to view except from the top of the falls, a short distance off-trail to the left at around 1.9 miles. Beyond, the path skirts around a set of tiered cascades and then switchbacks up the hillside to the fifth falls at 2.1 miles. This waterfall drops over a 62-foot cliff, crashing to a small pool and spraying approaching hikers with mist. Edging away from the falls, the Whiteoak Canyon Trail ascends another set of switchbacks and skirts the base of a high, thick wall. At around 2.4 miles, part of the trail is surprisingly paved with stone, the result of earlier handiwork that was apparently abandoned for the rest of the route. 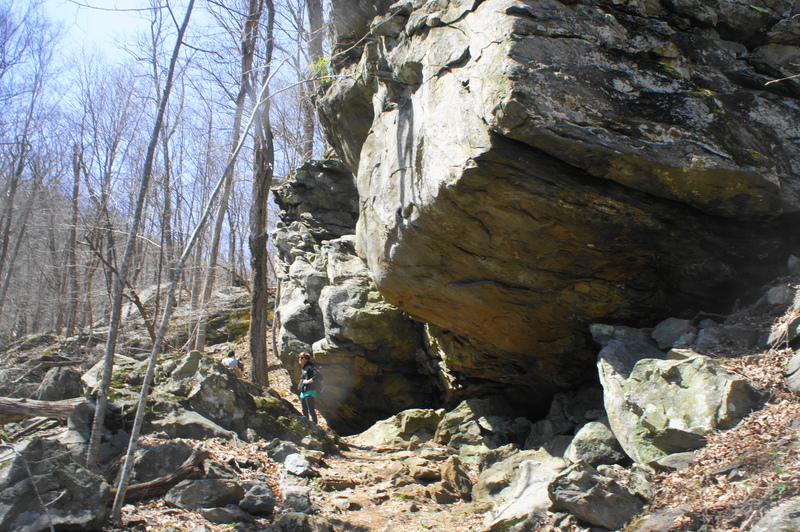 At 2.4 miles, hikers will reach a trail marker—but this is not a junction; stay right as the trail continues, climbing up a neatly arranged stone staircase to the clear a bluff. 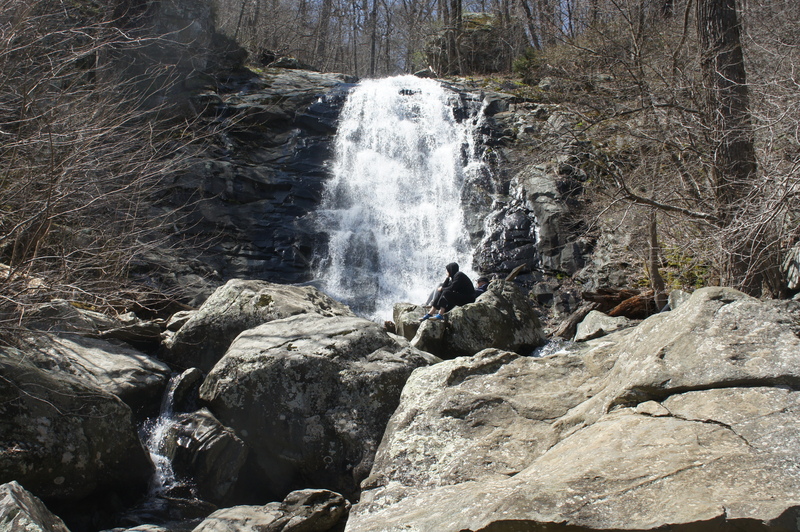 Atop the hill awaits a view of the sixth and final waterfall in Whiteoak Canyon: at 86 feet, the sixth falls, or Upper Whiteoak Falls, is the tallest waterfall encountered on the hike and the second-highest in Shenandoah. The Whiteoak Canyon Fire Road is a relatively dull and uneventful connector between Whiteoak Canyon and Cedar Run. The road gradually climbs amid oaks, chestnuts, and maples, occasionally offering obscured views of Old Rag through the trees on the left. At 3.7 miles, the road rounds a sharp left-hand bend and ascends to a point within striking distance of Skyline Drive. Just before meeting Skyline Drive, take a left on a yellow-blazed single-track at 4.2 miles—this is a section of the Skyland-Big Meadows Horse Trail. 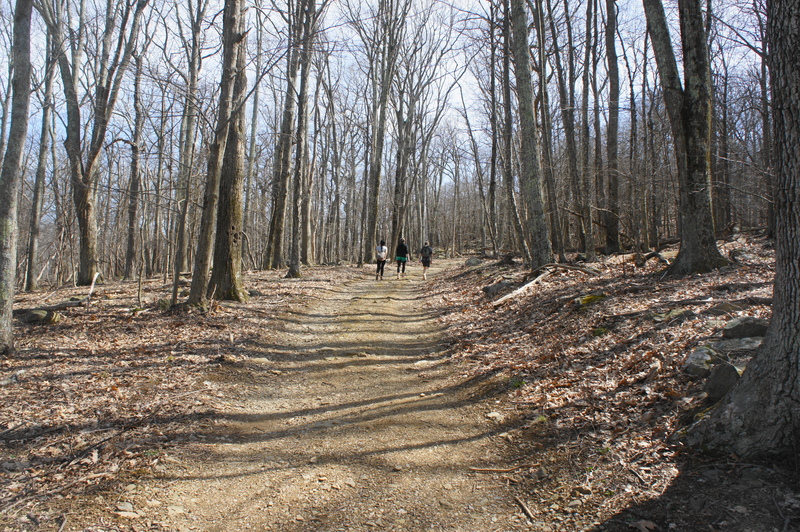 For the next 6/10 mile, hikers will bear west toward the Hawksbill Gap Trailhead, with Hawksbill (4,049’)—the highest peak in Shenandoah—visible ahead. Remaining within earshot of Skyline Drive to the right, the path makes minor dips and climbs but stays mostly level before approaching the trailhead at 4.8 miles. Instead of going right to the parking area, hang a hard left at the junction. This is the start of the Cedar Run Trail. While the waterfalls of Whiteoak Canyon are grand and showy, Cedar Run’s smaller cascades, nestled in a narrow ravine, feel more subtle and intimate. As the Cedar Run Trail begins to descend, the walls of the canyon become more defined, and the first trace of water is spotted around 5.2 miles. What begins as a trickle quickly turns to rushing cascades. 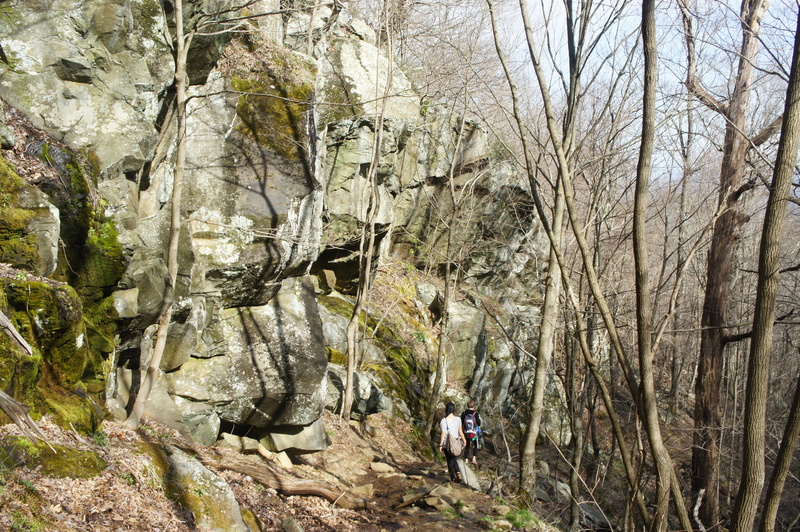 A small, 12-foot falls precedes an intriguing section where the trail hugs the base of a high wall on the left. 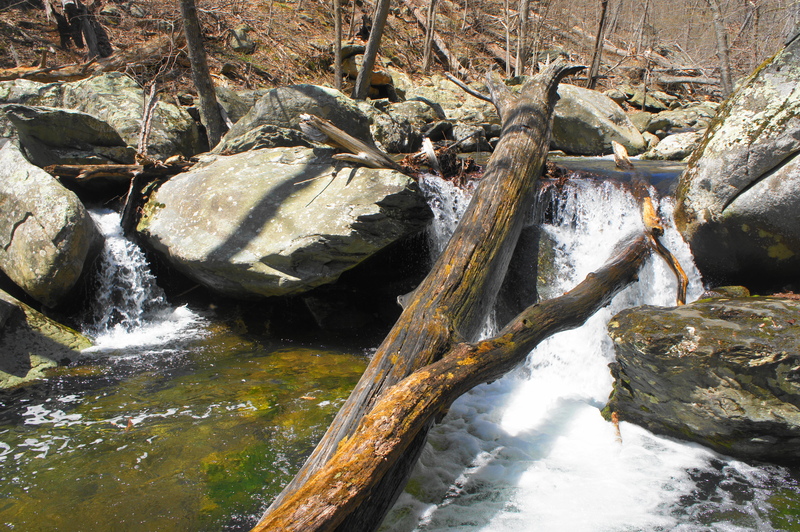 The creek is shock full of rocks, fallen trees, and other obstacles, creating a mosaic of cascades that split and converge dozens of times. At the 6-mile mark, a small tributary enters from the west. 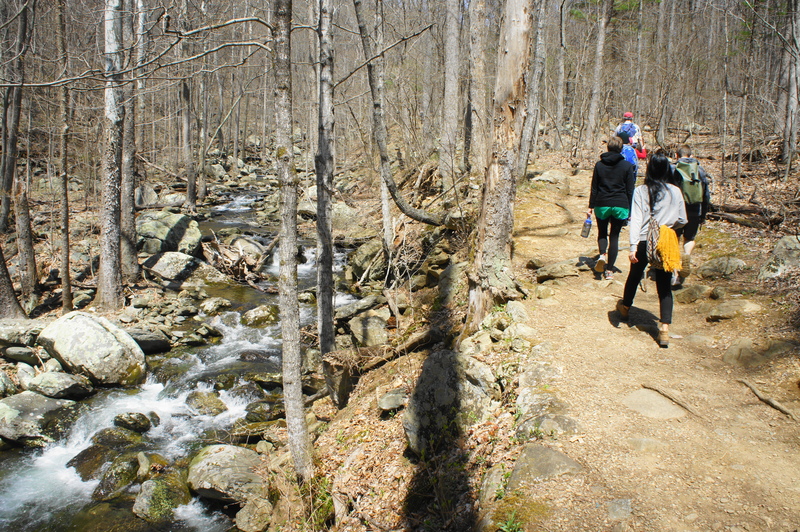 Cross the creek at 6.2 miles, then climb a short uphill section, hugging the side of the broadening valley. At 6.3 miles, the trail drops sharply and emerges suddenly at the base of a 40-foot natural water slide, a popular destination on a hot summer day. Far more striking, however, is the scene that awaits a few dozen yards later: Cedar Run Falls. Here the stream squeezes through a narrow sliver then drops 34 feet into a small box canyon, forming a beautiful and photogenic spectacle. It is worth stopping for a break here to admire the natural beauty. 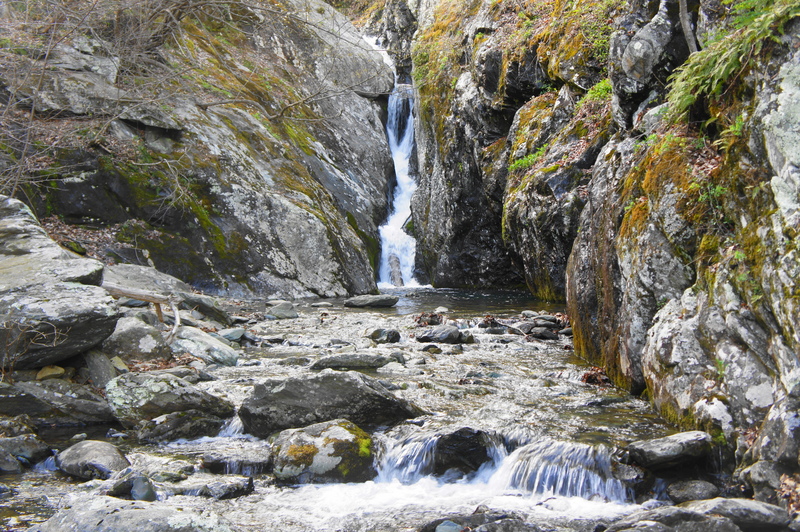 Leaving the falls behind, the trail rises above a small gorge and begins to distance itself from the stream. At a point where the valley opens up significantly, another falls plunges over a cliff—but this one is difficult to see through the trees. A second such falls—shorter but beautifully split in two by a jagged boulder—comes into view minutes later. After spending much of this stretch well above the creek, the trail descends to stream level at 7.1 miles and crosses Cedar Run for the penultimate time. Partly hidden between two boulders, a final 12-foot waterfall guards the mouth of the canyon. The terrain beyond is significantly flatter as you approach the original trailhead. Stay right at the fork at 7.25 miles, where the Cedar Run Trail intersects with the Whiteoak-Cedar Run Link Trail. Aside from a huge chunk of stone visible across the stream at 7.5 miles, the rest of the hike is relatively uneventful. 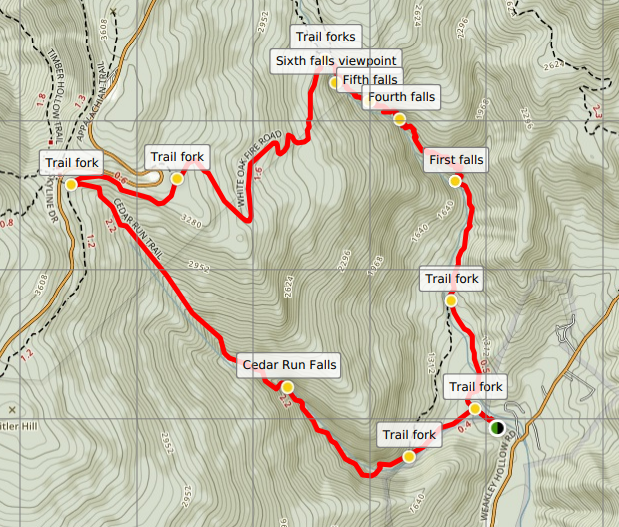 At 7.7 miles, the Cedar Run Trail merges with the Whiteoak Canyon Trail at the original junction, and bearing right takes one across the first bridge and back to the ranger station and parking area. 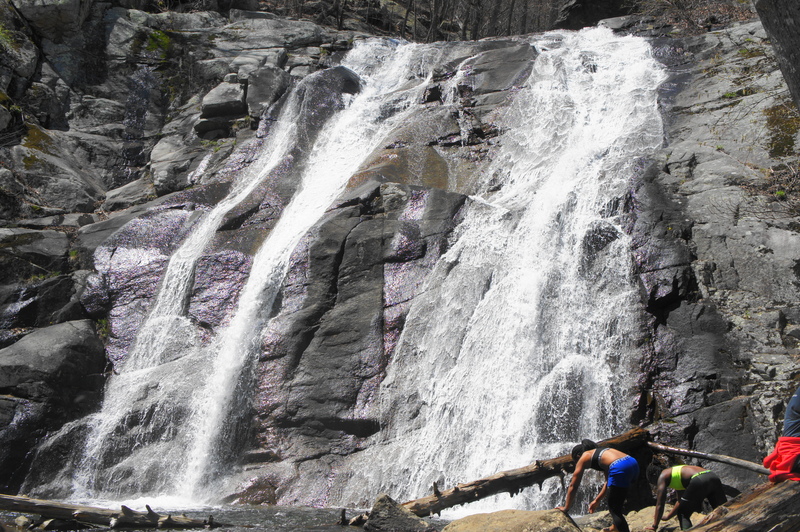 Hikers should allot at least 5-6 hours for this 7.8-mile circuit due to both its difficulty and the natural allure of the various waterfalls. Weary legs are a worthy price to pay for this outstanding hike, clearly one of the best in northern Virginia and the Washington, DC area. 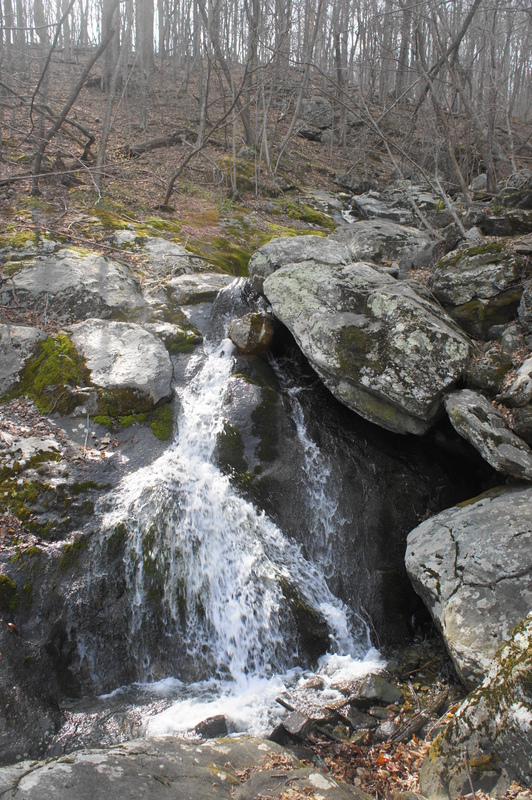 This entry was posted in Shenandoah National Park, Strenuous Hikes, Virginia and tagged canyon, Cedar Run, Cedar Run Falls, loop hike, Robinson River, Shenandoah, Skyland-Big Meadows Horse Trail, Skyland-Big Meadows Trail, Skyline Drive, Virginia, waterfall, Whiteoak Canyon, Whiteoak Canyon Falls, Whiteoak Canyon Fire Road, Whiteoak Falls. Bookmark the permalink.